Pumpkin spice is as ubiquitous as election ads on TV these days -- it's in practically everything at Trader Joe's, in beer, on French fries, in Starbucks (obviously! ), and in... White Russians? Sure! But unlike those election ads, this news is going to make you super happy: Krispy Kreme is going pumpkin spice on October 26th. Krispy Kreme announced that they've never once changed the flavor of the Original Glazed donut they're so famous for -- until now. 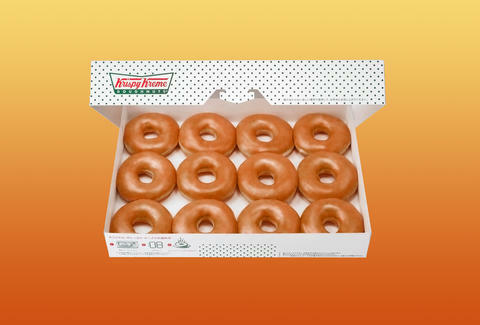 If you go to participating shops on October 26th (not every single Krispy Kreme in the country is doing this promotion, so check first), you'll get the opportunity to buy a Pumpkin Spice Original Glazed donut. But stock up, because it's the first time the recipe has changed in 79 years, and it's not sticking around. If the donut isn't enough Krispy Kreme-based pumpkin spice for you, consider pairing it with its limited-edition pumpkin spice latte. Lee Breslouer is a senior writer for Thrillist, and needs a donut in his life. Follow him to snacking: @LeeBreslouer.